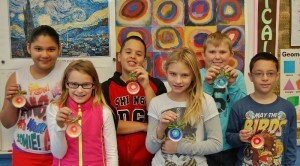 Colorful ornaments made by Hambright Elementary School students will be on display at Lancaster Museum of Art’s “Trees Galore” exhibit Nov. 20 to Dec. 13. Fifth-grade students of art teacher Heather Wigerman created the ornaments after studying the artwork of Wassily Kandinsky and Vincent van Gogh. Students based their swirling color choices on the warm and cool colors of the color wheel. Each ornament is framed by a canning jar lid and adorned with a silk-and-tinsel ribbon and dashes of glitter. The ornaments will be displayed on a tree in the museum’s first-floor gallery along with the creations of students from five other Lancaster County schools. All ornaments will be available for purchase, with proceeds benefitting the museum. The student artists, their family members and teachers will participate in a reception from 5 to 7:30 p.m. Nov. 20 to mark the start of the show. Penn Manor musicians will perform during the event. Congratulations to Ms. Wigerman and her budding artists!